The State of Palestine has assumed the chairmanship of the Group of 77 and China, the largest UN block of developing countries. H.E. Mr. Mahmoud Abbas, President of Palestine, was handed the annual presidency of the G77 during a ceremony at the United Nations. In his speech, H.E. Mr. Abbas said that Palestine would use its chairmanship to preserve the multilateral international order and strengthen ties with UN partners. Egypt was the previous Chair of the G77, a coalition comprised of 134 members, along with China, with a rotating chairmanship to different members each year. 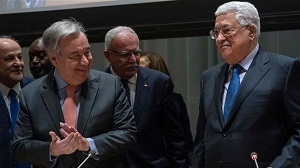 In his remarks at the annual ceremony for handover of the rotating chairmanship of the Group, the UN Secretary General Antonio Guterres considered this a “historic” moment for Palestine. He added that now “Palestine and its citizens have first-handed experience of some of the most challenging and dramatic global issues we face”. In a statement, the Organisation of Islamic Cooperation (OIC) welcomed Palestine’s assumption of the chairmanship of G77 and China, stressing that this would consolidates Palestine’s status in the international arena and confirms its right to full UN membership. The OIC Secretary General, Dr. Yousef bin Ahmed Al-Othaimeen, congratulated President Abbas and stressed his confidence in its ability to carry out its duties effectively. He also reiterated the OIC’s support for the efforts of the Palestinian leadership to enable Palestine to exercise its right to accede to international organizations and conventions, protect the Palestinian people, assert and defend their legitimate national rights, and embody the independence of the sovereign State of Palestine on the 1967 borders, with Al-Quds Ash-Sharif as its capital. 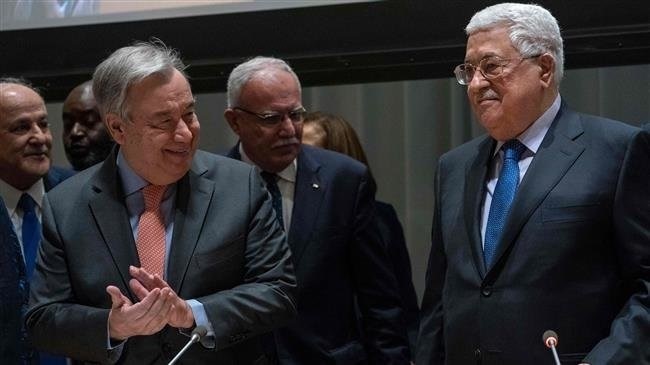 The decision to elect Palestine as the Chair for 2019 was taken in September 2018 by the foreign ministers of the Group’s member states. To make this possible, the UN General Assembly in 2017 adopted a resolution that gave Palestine additional privileges and rights to act as the Chair of the G77. The Group was established on 1964 by 77 developing countries and its goal is to help countries of the South to promote their collective economic interests and enhance their capacities on all major international economic issues within the UN system and promote South-South cooperation for development.